Imbued with the power of electricity, Electro is a supervillain who habitually plagues Spider-Man. Making his comic debut in 1964, Electro has been shown acquiring his superpowers in various ways, ranging from freak lightning accident to risky experiments with electricity. In 2014, Electro appeared in the film The Amazing Spider-Man 2 as an electrical engineer who was struck by lightning before falling into a tank of eels. Here at Superheroes Direct, our selection of Electro gear features his look from the 2014 film. We offer high quality Electro costumes for adults and children looking to dress up as their favorite Spider-Man villain as well as collectible figures, bobble heads, and more. Keep checking back here at Superheroes Direct for updates to our supply of Electro merchandise. Being chased by a mob of supervillains is nothing new for our favorite Spidey of the Marvel Universe. 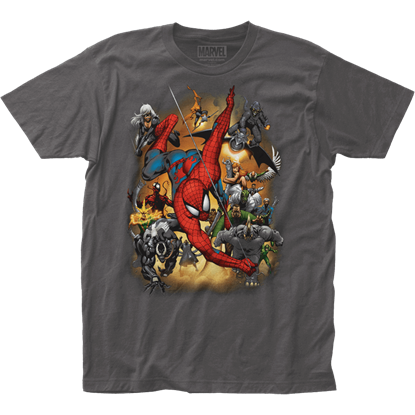 By trusting in his web-slinging ability, he maintains the lead in the image featured on the Spider-Man Villains Attack T-Shirt.